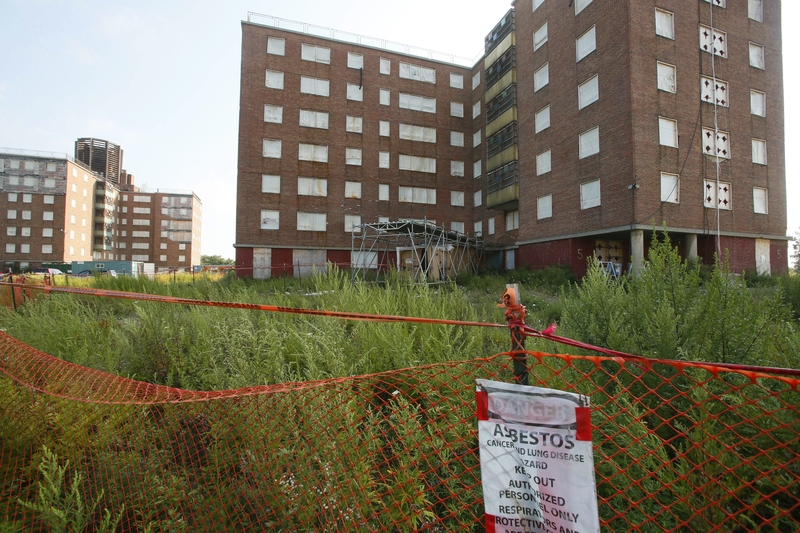 During their work at the Kensington Heights housing complex, Ernest Johnson’s employees dumped asbestos down holes cut in the floor. They also failed to adequately treat the cancer-causing material while it sat waiting for leak-tight containers. One of the consequences, the former contractor acknowledged Wednesday, was the repeated release of asbestos into the environment around the East Side complex. Johnson’s admissions Wednesday are part of a plea deal in which he acknowledged his company’s role in bungling the five-year-old clean-up effort of Kensington Heights, a collection of vacant public housing towers. “There was asbestos left in the buildings,” said Assistant U.S. Attorney Aaron J. Mango. By pleading guilty to violating the federal Clean Air Act, Johnson became the most important defendant to admit guilt in the case. His company, Johnson Contracting of Western New York, was accused of orchestrating a scheme designed to cut corners at Kensington Heights and then cover it up. Visible from the Kensington Expressway, the 17-acre complex on Fillmore Avenue is owned by the Buffalo Municipal Housing Authority and at one point was targeted for demolition as part of a larger plan to redevelop the site into a $105 million retirement community. Until now, the only defendants in the case to take plea deals have been compliance monitors hired to inspect Johnson’s work. Those monitors, from JMD Environmental Inc. of Grand Island, have admitted falsifying inspection reports to cover up the fact that asbestos remained in some of the buildings they had certified as clean. JMD and Johnson shut down shortly after they were charged in a 23-count grand jury indictment in 2011, and the charges against both companies have since been dismissed. The government’s case against the remaining defendants, including a now-retired state Labor Department inspector and two City Hall inspectors, is scheduled to go to trial in two weeks, and Johnson could be among its key witnesses. “The defendant agrees to cooperate with the government,” Mango told U.S. District Judge Richard J. Arcara. In return for his cooperation, Johnson could receive leniency when he’s sentenced by Arcara. He is currently facing up to 30 months in prison.